Posted on 9 June 2016 under Book Review & Literature, History, Pacifism. But what about World War II? It is considered the ultimate trump card in any debate on the effectiveness of nonviolent resistance. Not entirely by accident, it is also the title of an IFOR brochure on this very question. (1) It was President Obama’s main defense for his justification of the use of force in his acceptance speech of the Nobel Peace Prize. It was one of the main stumbling blocks for Martin Luther King Jr. towards embracing nonviolence, and it is the standard reaction of most people involved in government and the military to suggestions of implementing forms of nonviolent civil defense. The implication, of course, is that the Nazi regime was so violent and abhorrent that it could only be stopped by brute force. The other side of the coin, though, is that if one could argue successfully that some forms of nonviolent resistance did prove viable during WWII, it would follow that these strategies would be effective under most circumstances. That was what the War Resisters’ International set out to demonstrate when, in 1952, they embarked on the idea to put together a book on accounts of nonviolent resistance. Although the WRI succeeded in amassing some first-class examples, the amount of material collected was deemed insufficient to be published as a book. (2) Others followed suit, such as Gene Sharp in his 1958 Peace News Pamphlet Tyranny Could Not Quell Them, in which he detailed the successful non-cooperation campaign by the teachers of Norway, and Jacques Sémelin’s Unarmed Against Hitler: Civilian Resistance in Europe 1939-1943. (3). George Paxton is a trustee of the Gandhi Foundation in London, editor of the quarterly journal The Gandhi Way, and author of several books and numerous articles on Gandhi. 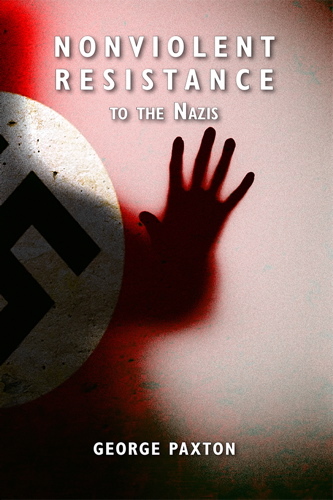 For his recent book Nonviolent Resistance to the Nazis he has collected an impressive amount of research and combined it into “a perspective on the Nazi era which is rarely put forward,” and he has also looked at accounts of rescuing persecuted Jews and at acts that have been much less thoroughly studied, which he describes as “nonviolent resistance by the people on their own behalf.” (4) Roughly a third of his book is devoted to a nation-by-nation account of various forms of nonviolent resistance, another third to fourteen case studies, some of them well-known, others less so, and the last third to his own analysis of the accounts he has presented. The first two parts provide a treasure trove of information, but it is the last part where the book comes into its own. Here he discusses, among many other things, the potential of nonviolent resistance, what makes people potential resisters and rescuers, what makes countries more prone to nonviolent resistance, and what a Gandhian style of nonviolent resistance might have looked like. If we were to have a quibble with the book it might be that, for a second edition, it would be tremendously helpful to students and scholars alike were Paxton to cite the sources for his extensive research. That nonviolent methods can be effective against violent authoritarian regimes has been thoroughly discussed by Erica Chenoweth and Maria Stephan. (6) Based on their study of 323 campaigns between 1900 and 2006, they concluded that nonviolent campaigns are twice as successful as violent ones, on average draw four times as many participants, and are more likely to lead to stable democratic regimes. Whether nonviolent methods alone would have been sufficient to bring down a Nazi-type regime is harder to answer. And as Paxton reminds us, it is important to take into account that a good deal of nonviolent resistance that took place during WWII was of a pragmatic nature, that people simply used whatever method was available, and that little was known about past examples of the successful application of forms of nonviolent resistance. A greater awareness of these might have resulted in a wider use of nonviolent tactics. It is of course impossible to say if that would have made any difference; yet, as Paxton states, “Without the cooperation of a large proportion of an occupied nation a regime is unstable and in the long-run it will collapse.” Therefore, a consistent use of social, economic and political non-cooperation, or “nonviolent coercion” as Gene Sharp puts it, combined with the Gandhian principle of trying to convert the opponent by recognizing his or her humanity, might be a tool that is sufficiently powerful to slow down or stop a Nazi-type regime in its tracks. In order to learn more about what it takes for people to become rescuers or resisters, Paxton has tried to discern some common characteristics. Although there is no clear-cut distinction between resisters and rescuers, generally speaking WWII resisters tended to be motivated by strong religious or political conviction. For example, the religious group that was staunchest in its resistance was the Jehovah’s Witnesses, and the politically motivated were most likely to be either communists or patriots, whereas rescuers were more likely to have been moved by empathy. Yet a willingness to help was in itself not enough. There were other requirements, such as sufficient space for a hiding place, the ability to procure extra food or to keep a clear head under stress. Therefore, rescuers who hid Jews tended to have larger homes and often had a larger network of likeminded friends and acquaintances. Indeed, as Paxton points outs, the majority of rescuers were asked for help by those within their own network. Rescuers were also from the “helping” professions, such as doctors, nurses, teachers and social workers, or they happened to be well positioned to help, as was the case with some diplomats who were able to provide passports and other travel documents to people in need. It would seem that rescuers also shared certain traits: a nurturing home, altruistic parents, a certain tolerance for people who differed from themselves, and an encouragement of independence of thought, while others were from a strict religious background which on the surface seemed intolerant. When it comes to national attitudes towards nonviolent resistance during Nazi occupations it is risky to generalize. Obviously, the Nazi occupiers did not treat all countries the same. Eastern Europe was supposed to provide Lebensraum (i.e. the indigenous people were supposed to make place for German colonists so as to solve Germany’s agricultural crisis), whereas Scandinavia and Holland were looked upon as kindred races and thus treated less harshly. Still, countries with a strong democratic tradition and a well-developed civil society seem to have been more inclined towards non-cooperation. The same holds true for countries that were more ethnically homogenous or that had a tradition of tolerance and a lack of anti-Semitism. Yet, the success of most forms of nonviolent resistance also heavily depended on such practicalities as the availability of money from governments-in-exile and international organizations, and the close proximity of neutral and non-occupied countries where Jews could be shepherded to safety. In the final part of the book Paxton speculates on what a resistance based on Gandhian principles might have looked like, and provides two major conclusions. The first is that where the resistance movement was wrapped in secrecy, a Gandhian-style resistance would have been conducted as openly as possible, in part because open nonviolent resistance might have persuaded bystanders to take action and in part because of the effect the courage displayed would have had on the Nazis, but also because Gandhi believed in the unity of ends and means. The second is that the evil progression of stages in the Nazi attempt to eliminate all Jews might have been brought to a halt sooner, though no doubt still at a tremendous cost of lives. Needless to say nonviolent resistance to the Nazis would have taken tremendous courage in a situation in which few people realized what the devastating end result would be. But although it cannot be said with any certainty whether nonviolent resistance alone could have resulted in the toppling of the Nazi regime, there is at least some room for optimism about the future, as the study by Erica Chenoweth and Maria Stephan demonstrates. Also, research into nonviolent resistance has come a long way since the 1940’s, and especially in the field of nonviolent defense a lot of progress has been made. (7) All in all George Paxton has provided us with much food for thought. In doing so his book offers us a great service. (1) But What About World War II? (Amsterdam: International Fellowship of Reconciliation, 1980). (3) Gene Sharp, Tyranny Could Not Quell Them (London: Peace News, 1958); Jacques Sémelin, Unarmed Against Hitler: Civilian Resistance in Europe 1939-1943 (London: Praeger, 1993). (4) George Paxton, Nonviolent Resistance to the Nazis (London: YouCaxton Publications, 2016), p. 1. (5) B.H. Liddel-Hart, “Lessons from Resistance Movements: Guerrilla and Nonviolent,” in Adam Roberts, ed., Civilian Resistance as a National Defence (Harrisburg: Stackpole Books, 1968), p. 205. (6) Erica Chenoweth and Maria Stephan, Why Civil Resistance Works: The Strategic Logic of Nonviolent Conflict (New York: Columbia University Press, 2013). (7) The concept of nonviolent defense gained remarkable popularity during the 1970′s and early 1980′s, after it was renamed civil, civilian, civilian-based or social defense to make it more palatable to governments. At that time Sweden and the Netherlands were considering the inclusion of forms of nonviolent defense in their military defense strategies. Some of those who have studied the issue include Gene Sharp, Johan Galtung, Theodore Ebert, Charles Walker, Michael Randle, and Gene Keyes. EDITOR’S NOTE: Gertjan Cobelens is our Pacifism Editor and in charge of our research project at the IISG, Amsterdam, now in its second year. For other of his articles and introductions and an index of other materials from the project please click on the IISG/WRI Project link in the Category sidebar, or above.